Every student at Barron Swim School enjoys receiving their different colored wristbands to identify where they go for their class. Did you know these wristbands also help us keep the kids and the pool area safe? 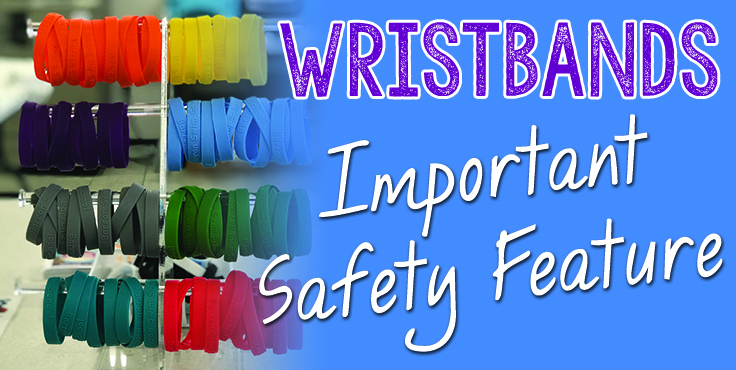 Here are a couple ways in which the colored wristbands keep our children in a safe environment. THEY SERVE AS A ROAD MAP: The kids know to match the color of their wristband with the appropriate color fish on the sides and back to their teacher’s box on the pool deck. Could you imagine if we just let the kids in and said go find your teacher. They would be everywhere going every which direction. This keeps our students much more organized and anxiety free. WE KNOW THEY HAVE CHECKED IN: When the deck supervisor opens the door, they look to make sure each child has a wristband. This ensures each child has checked in and has been accounted for. It also helps to guarantee they receive the correct color bracelet to get to the proper class. BLACK AND WHITE WRISTBANDS: These wristbands provide very important information to the deck supervisor and the teachers. The white band lets us know we have a brand new student and the black band lets us know the student is doing a makeup. This keeps our teachers up to date on each child and informs them of what they may or may not need to work on. Although a colored bracelet is simple, these are three major reasons they help us keep your child as safe as we can once they entered the swim school. A lot of thought and organization has been put in place to keep your child safer in and around the water, especially here at Barron Swim School.